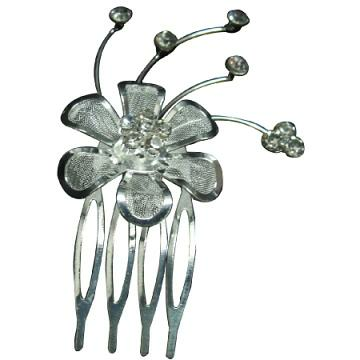 Fabulous silver plated net flower rhinestone hair tiara comb fascinator headpiece. Rhinestone encrusted piece is designed in a floral decorative pattern that sparkles. Designer quality at reasonable price erfect accessory any bride or mother of the bride. Buy Silver Plated Net Flower Rhinestone Hair Tiara Comb, sold & shipped by Fashion Jewelry For Everyone where you can shop online for Leading Online Retailer for Indian Fashion Jewelry. This Brooch, Pins & Bands collection has been tagged as Tiara Comb,Hair Tiara Comb,Rhinestone Hair Comb,Silver Flower,Hair Comb,Silver,Plated,Net,Flower,Rhinestone,Hair jewelry.